Friends, today’s PSD download is a simple pricing table template in Photoshop PSD format. 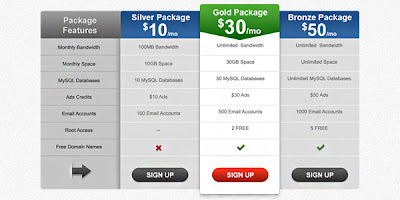 The web pages with pricing features are getting more attention as they represents business. Hope this pricing table freebie comes handy! The pricing table graphic has 4 columns with 3 main columns for the packages while the other column shows the features offered for each package. The table design comes in fully layered PSD format with each part organized in named folders, so you can easily edit necessary text and graphics to suit your individual business need. You may also like to download similar freebie: Pricing table PSD template.